Be the first to share your favorite memory, photo or story of Jeff. This memorial page is dedicated for family, friends and future generations to celebrate the life of their loved one. 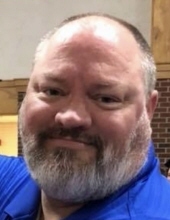 Jeff Hamblin, age 44, of Sullivan, passed away on Wednesday, November 21, 2018. Jeff Boyd Hamblin was born April 18, 1974 in Porterville, CA. He was the son of Theo D. “Ted” and LaWana Hamblin, nee Mackley. He grew up and attended school in California and eventually moved with his family to Sullivan, where he graduated from Sullivan High School in 1993. Jeff enlisted in the U.S. Army in 1996 as a combat engineer and had many military assignments through the years; including being stationed in Germany. He survived two deployments: Kosovo in 2000 and Iraq in 2003. As a result of these deployments, Jeff suffered from multiple health issues, including PTSD and depression, which ultimately lead to his death. Jeff was medically discharged in 2004 as an E-5 sergeant. Jeff then went on to graduate with his Associates Degree in EMT/Paramedics. He married the love of his life, Rebecca Rothermel, on April 9, 1993 in Washington, MO. To this union five children were born: Elizabeth, Jessica, Kelsey, Jacob, and Trevor. Jeff was a lifelong member of the Church of Jesus Christ of Latter Day Saints. He has served locally in numerous capacities. He had been active with the Boy Scouts of America, attaining his Eagle Scout status. He enjoyed many hobbies including motorcycle riding, cooking breakfast, and spending time outdoors. He loved sports, including combat sports and martial arts, but his favorite was watching his kids play sports. Jeff and his family would spend time playing games, going out to eat, and watching movies. Jeff was incredibly personable and had a “larger than life” personality. Family was of most significance to Jeff. He enjoyed being with them at all times. Even though his family was large, he made an effort to get to know them all personally, including his nephews and nieces individually. Jeff is survived by his loving wife of 25 years, Becky Hamblin; his six children: Elizabeth Hamblin and Jessica Hamblin, both of Sullivan, Kelsey Burlage and husband, Chase, of Virginia Beach, VA , Jacob Hamblin and Trevor Hamblin, both of Sullivan, and “bonus” daughter, Wendi Gratzl of Sullivan; a grandson, Theo Burlage; his mother, LaWana Hamblin of Sullivan; four brothers: Todd Hamblin and wife, Shana, of Dayton, NV, John Hamblin and wife, Mary, of Sullivan, Chris Richards and wife, Shelley, of Wentzville, MO, and David Hamblin and wife, Amanda, of Sullivan; three sisters: Paula Kern and husband, Ben, of Turlock, CA, Karyn Manumaleuna and husband, Lafi, of Eureka, MO, Linda Voelkel and husband, Ben, of St. Peters, MO; his parents-in-law, David and MaryAnn Rothermel of New Haven, MO; a sister-in-law, Jennifer Klenke and husband, Mike, of Villa Ridge, MO; three brothers-in-law: John Rothermel and wife, Kim, of Washington, MO, Josh Rothermel of Kansas City, MO and Matthew Rothermel and wife, Amber, also of Kansas City, MO; and numerous beloved nephews and nieces, other relatives and friends. He was preceded in death by his father, Ted. Funeral services will be conducted 11:00 AM, Wednesday, November 28, 2018 at the Church of Jesus Christ of Latter-day Saints in Sullivan, with Brother Karvel Kofoed officiating. Interment will follow in Old Cave Spring Cemetery in Sullivan. Visitation will be held from 4:00 PM to 8:00 PM, Tuesday, November 27, 2018 at the Eaton Funeral Home in Sullivan. To send flowers or a remembrance gift to the family of Jeff B. Hamblin, please visit our Tribute Store. "Email Address" would like to share the life celebration of Jeff B. Hamblin. Click on the "link" to go to share a favorite memory or leave a condolence message for the family.